Our lives have an ever increasing reliance on electronic devices which seems to expand all the time. These devices rely on one form of electricity or another. Battery operated devices such as cell phones and tablets need to be recharged and will need to be plugged into a wall socket or charging station at some time. Our new flat screen LCD TV, which we invested a lot of money in, will rely on a continues and consistent voltage of electricity to supply power. Same can be said about our desktop computers and laptops and so on. Are you doing enough to protect these devices from voltage fluctuation and/or power surges? Most grid systems providing the population power are reliable but are they infallible? Of course not. We all know too well about brown outs, black outs and power outages when systems are worked on or upgraded. These types of events can play havoc on your electronics and potentially cause enough damage to render them useless and require you to pay a considerable amount of money for them to be repaired. The great news is, this can be prevented by taking some simple and relatively inexpensive steps. A spike is a short increase in voltage and can be caused by lightning, power outages and malfunctions from the grid. A power surge is a more sustained increase in voltage and is a result of a problem with the power grid. Devices are designed to run on a certain voltage and will sometimes burn themselves out when these power fluctuations happen. They just can't handle the extra voltage running through their circuitry and will blow out transistors, capacitors and fry whole boards in some cases. First, you should know that standard outlets do not come equipped with any kind of surge protection. Surge protectors usually come in the form of power strips or sometimes called power bars and can be very simple or can be very advanced in their function and configurations. They can also be bought to fit over single sockets. Different models use different methods to accomplish this level of protection, but they generally have a system that diverts energy over to the safe threshold to a protective component within the surge protector unit. It ensures the only the normal, safe amount of electricity passes through to your devices. The cheapest of the power strips are often not surge protectors and only offer additional outlets. Read the labeling and make sure that it specifies that the product offers surge protection. Others in the same category of cheap products will offer a one time, one event surge protection. Once the surge protection is triggered, the product will no longer protect your devices. Definitely something to keep in mind. The image above to the far right would be what I would consider a rather cheap product. Some surge protectors come with lights that indicate when they can no longer provide protection, while other may even have an audible alarm. Replace them if you have any doubts or know that they are no longer working properly. 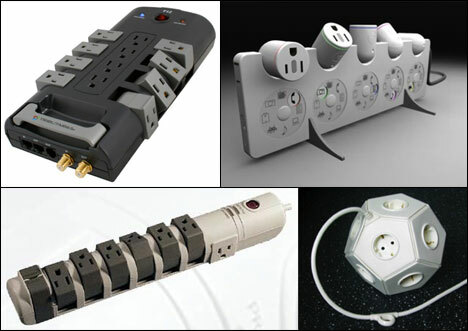 Surge protectors are a fairly inexpensive way of protecting your expensive gadgets. If your like me (slightly geeky) and have your own servers and work stations and other devices you rely on to do your work or you have expensive equipment that is critical to maintain running and protected, you might want to consider an Uninterruptable Power Supply (UPS). These are specifically designed to provide emergency power and maintain a steady current and voltage to your devices and prevent surges. They come in all kinds of sizes and flavors to suit different needs. From the home office with two or three PCs to supplying power to mainframes and server rooms, they can be a real life saver not to mention money server. These are a slightly more expensive but are worth it in the long run.